These boots have seen me through thick and thin, mainly thick. Purchased them over 10 years ago from can't remember where, somewhere fancy I think, they are made by Tommy Hilfiger. Probably, definitely the toughest boots I've ever owned. Easily out lasted my previous two pair of Timberlands. This year finally did them in, the fires of Southern California melted the soles off of them twice. They caught fire once this year as well while standing on super heated coals that used to be someone's home. Borrowed some duct tape from a Channel 4 news crew on the fire lines near Santa Barbara to hold them together. 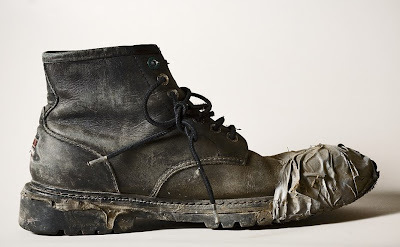 Wore these boots in the flooded streets of New Orleans Lower Ninth ward. Wore them through countless wildfires. Wore them for every major disaster I covered over the last ten years, and there's been many. These boots have served me very well, and if they could be properly buried they would. Don't know what quite to do with them now that they are retired. Think it would be sad and disrespectful to throw them out in with the garbage, but keeping them in my already crowded closet makes even less sense. Just replaced them with some fancy black hi-tech boots made by "RG", with carbon rubber soles and a steel shanked sole. They were suggested to me by KFWB's radio reporter Pete Demetriou. He swears by them, had a pair in his rig he showed me, says they will "last forever." We will see, they make a moon boot clomping sound when I walk in them and have a zipper on the side of them to quickly get them on and off with. Feel like a commando while wearing them, not happy about that. Haven't properly broken the new boots in yet, but I'm sure there will be plenty of "events" to test them with. God bless my old boots, I will miss wearing them.